Since Slipher and Hubble’s work in the 1920’s, it has been known that the Universe is increasing in size as time goes on; this is why distant galaxies are seen to be moving away from us. It had long been assumed that the gravitational attraction between bodies would cause the rate of expansion to slow down, and perhaps even turn the big bang into a ‘big crunch.’ However, astronomers were surprised to discover in the 1990’s that the speed of expansion is actually accelerating with time, a discovery which earned the 2011 Nobel Prize in Physics. This acceleration requires a radical modification of our previous models of cosmology. One possibility is that the Universe is filled with a new type of substance, generically called Dark Energy, which is effectively gravitationally repulsive. (Alternatively, it is also possible that the laws of gravity are different on cosmological scales, or that our assumption that we do not live in a special place in the Universe is incorrect.) If dark energy does exist, we need to understand it, as it seems to account for 70% of all the matter in the Universe. Crucially, we want to understand whether it is constant in space and time (a cosmological constant), or it is dynamical, which would indicate a new type of physics. We study dark energy in a variety of ways, through its impact on the geometry of the Universe or by how it affects how fast large structures gravitationally collapse. We use supernovae as ‘standard candles,’ and features in the distribution of galaxies as ‘standard rulers’ to measure the background geometry. We can also use weak gravitational lensing and the peculiar velocities of galaxies to study the distribution of dark matter and infer how its structure evolves. 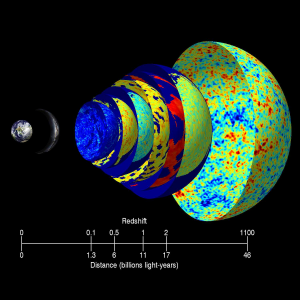 Changes in the evolution of gravitational potentials can also impact CMB light as it travels through cosmic structures, through the integrated Sachs-Wolfe effect. This can leave correlations between the CMB light and the galaxy distribution which can also help tell us about dark energy. Recent ICG work has focused on how the existence of dark energy can induce correlations between the cosmic microwave background and an array of relatively nearby surveys, such as the SDSS and the NVSS radio survey. Combining information from these various probes will help us determine the nature of dark energy and how it behaves, whether it is a cosmological constant or dynamical, or whether it interacts with ordinary matter.